It has been since 2014 that I made a trip once again to the charming city of Bamberg, Germany. Located in Bavaria in the Upper Franconia region. Bamberg is known for its seven hills synonymous with Rome, smoked beer taverns, and charming half-timbered homes down the riverbank of Little Venice. With so much historical significance, Bamberg actually landed a spot in the UNESCO World Heritage Site since 1993 and I can definitely see why. Bamberg isn't what generally comes to mind when you first think of Germany. Unlike that of Berlin, Munich, or Frankfurt; Bamberg retains a lot of historical significance and you see it every where you go. Not much has changed since I was there last four years ago. It is perhaps a little bit more culturally diverse with Turkish shops, Chinese grocery stores, and phở restaurants popping up around the town. (But hey, where can you go these days and not find a phở restaurant? Seriously.) Constant structural improvements in the town's architecture are an ongoing occurance as renovations are being made to the old churches, roads, and buildings as time and history continually marks the town's landscape. Charming alleyways with pastel colored apartments. During my two weeks there I made several stops down to the heart of the city itself. Landmarks such as the Altes Rathaus or the old town hall, the Bamberg Cathedral, and the Late Hofhaultung (old palace) are always a sight to see (and another couple photographs to take). We walked so much my legs basically became spaghetti be the end of every day, al dente of course. There was literally so much to soak in, there was no possible way of seeing everything within the span of a few days time there. On warm spring and summer days, luckily enough we had some warm days of sunshine, you can catch crowds of people sitting over bridges casually enjoying their bottled beers and wines talking amongst themselves. It's not something I see a lot of ordinarily from where I am from, but it is something to be appreciated. The casual and laid-back nature of the locals in Europe really makes me want adopt it into my daily life more often than not. Das Eckerts restaurant in Bamberg, Germany. Sprinkled throughout Bamberg are hidden gems only perhaps locals would only ever find. Such as a surprisingly modern and high class themed restaurant known as Das Eckerts that specializes in Franconian cuisine with a contemporary twist on each of their dishes. Sauerbraten with Potatoes and Snap Peas at Eckerts. Of course, then there is Schlenkerla, the home of the Rauchbier or smoked beer. You can not come to Bamberg and not stop by here. Touristy as it is, it's a must-have experience if you're going to stop by Bamberg for any reason. Yes, even maybe perhaps for business. Having an outdoor meal at the Gasthof Schiller Biergarten! Where I spent the most time, was in Strullendorf and boy is the food there AMAZING. If you're looking for a spot crowded by locals, good brews, radlers (not the Americanized watered down grape juice kind), and amazing Bavarian country style meals; head over to Gasthof Schiller for a plate of their “Schäuferla” (roasted pork shoulder) and a half liter (or more) of Kellerbier and you'll be golden for the rest of the night. Until the next day that is, if you're anything like me. No, I don't know where all that food goes. So stop asking. 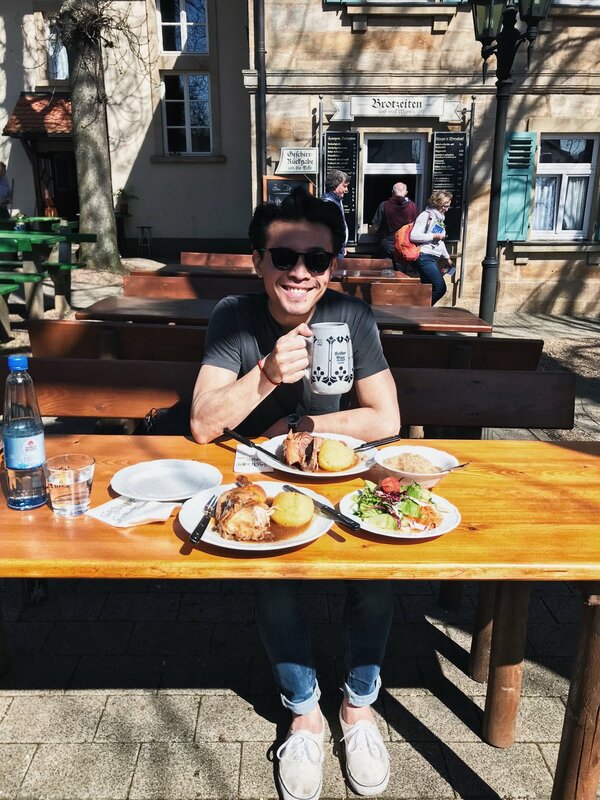 On sunny days, you can take the joy of shoving your face with food outside at their biergarten. What? You heard that absolutely right. There's an outdoor seating area that's so family friendly there's a playground and even a pen for bunnies to keep the kids busy while the adults down their fifth beer. The town of Bamberg will always have a place in my heart. Even more so than any other German city as it has left such a long-lasting impression on me four years ago as it did once more this time around. * The German word "gemütlichkeit" can be compared to the Danish "hygge" meaning a mood of coziness and comfortable conviviality with feelings of wellness and contentment.